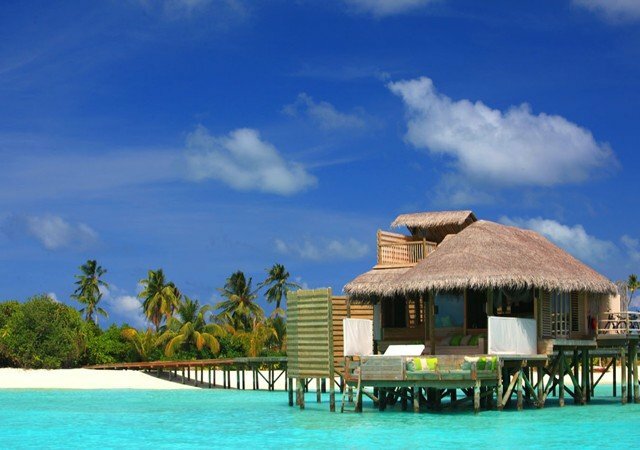 Six Senses Laamu is a palm-fringed paradise encircled by a spectacular house reef and coral garden that offers unparalleled snorkeling and diving experiences. The only resort in the Laamu Atoll and reached by an inter-island plane trip from Malé International Airport and a short boat ride, the island is one of the Maldives’ top resorts for snorkeling and diving, and home to the Maldives’ most famous surfing wave breaks, Yin Yang, where it is common to see schools of dolphins frolicking in the waves. 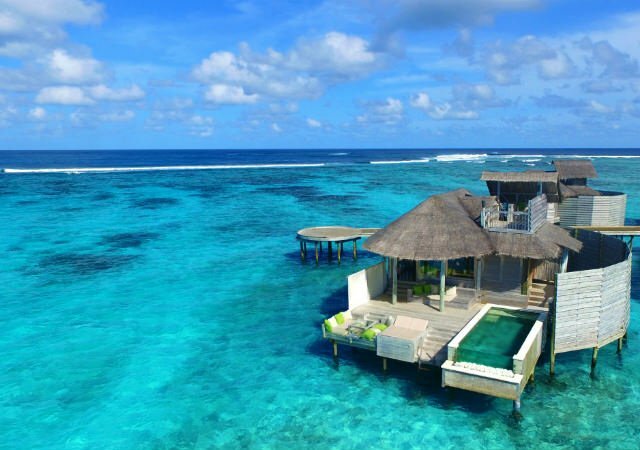 Six Senses Laamu boasts a combination of beautifully appointed on-land and over-water stylishly sustainable villas constructed of sustainable materials and offering unfettered ocean views. Thatched Crusoe-esque villas have contemporary décor, luxurious living spaces and luxurious extras such as glass sunken bathtubs, treetop decks, and private plunge pools, the resort has the most significant over-water facility in the Maldives with five elegant lounges and restaurants with endless ocean views. Nothing is spared from an ice cream station, a chocolate room, a wine and cheese cellar, an award-winning Asian restaurant, and a unique zero-carb restaurant, which uses local produce grown in the island’s organic gardens. An array of deluxe amenities and activities can be enjoyed from pampering spa and body treatments, surfing the atolls most famous waves at Yin Yang, exploring the neighboring Hithadhoo Island on island-hopping excursions, or relaxing with a picnic on an uninhabited private palm-fringed island surrounded by shimmering turquoise waters. 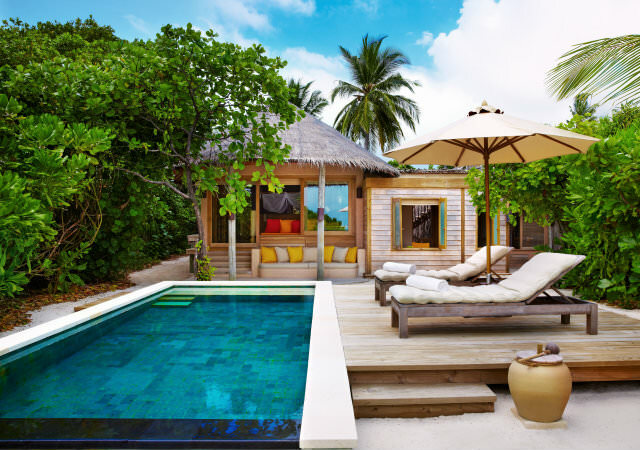 Designed to reflect the Maldives’ unique culture, beautifully appointed accommodations made up of one and multiple-bedroom villas offer comfort and luxury with spellbinding ocean views. Dappled shade from surrounding palm trees falls onto Crusoe-esque villas with spacious en-suite bedrooms, airy living spaces furnished in stylish contemporary décor, and a range of deluxe amenities. Villas enjoy private access to the beach, beautiful gardens with daybeds, panoramic upper dining decks at treetop level with viewing platforms, and uninterrupted ocean views. Modern amenities abound, including flat-screen televisions with satellite channels, Bose entertainment systems, iPod docking stations, personal bars and fresh beverages, coffeemakers, air-conditioning, IDD telephones, and complimentary wireless Internet. Hidden among the lush tropical vegetation facing the lagoon and a few meters from the beach, Lagoon Beach Villas feature king-size bedrooms and en-suite bathrooms with rainfall showers and soaking tubs, as well as outdoor branch-encircled showers or outdoor bathtubs. Private gardens have sun loungers and offer tranquil places to relax, and treetop dining decks have comfortable seating and dining areas with spectacular views. Located on the sunset side of the island amidst lush tropical vegetation, Ocean Beach Villas are sustainable and private retreats that are strategically placed for sunshine and shade with plenty of sun loungers for kicking back and relaxing in style. Ocean Beach Villas feature king-size bedrooms and en-suite bathrooms with rainfall showers and soaking tubs, as well as outdoor branch-encircled showers or outdoor bathtubs. Private gardens have sun loungers and offer tranquil places to relax, and treetop dining decks have comfortable seating and dining areas with spectacular views. Set within the island’s forest and looking out over the beautiful lagoon, Lagoon Beach Villas with Pools boast elevated panorama decks, private swimming pools with pool decks and sun loungers surrounded by lush tropical vegetation, and soft sea breezes, and an open-air branch-encircled shower and outdoor bathtub offer bathing beneath the stars. A treetop deck which features a comfortable seating and dining area is perfect for alfresco dining. These private Ocean Beach Villas with Pools offer stunning views of the Indian Ocean from among the lush tropical vegetation on the sunset side of the island. Ocean Beach Villas feature king-size bedrooms and en-suite bathrooms with rainfall showers and soaking tubs, as well as outdoor branch-encircled showers or outdoor bathtubs. Private gardens have sun loungers and offer tranquil places to relax, and treetop dining decks have comfortable seating and dining areas with spectacular views. Private pools are only a few meters away from the beachfront, and sun loungers are strategically set for sunshine and shade by the pool deck. Weathered timber jetties lead to these over-water havens, which are secluded by high wooden enclosures and enjoy direct access to the sea and spectacular views of the lagoon. Relax in the over-water netting hammock, swim off the private deck or soak up the sun on sun loungers on the expansive pool deck. These villas feature glass bottom tables on the outside deck, glass over-water bathtubs with views of the lagoon and outdoor rain showers, and treetop decks with comfortable seating areas. Weathered timber jetties lead to these over-water havens, which are secluded by high wooden enclosures and enjoy direct access to the sea and spectacular views of the lagoon. Relax in the over-water netting hammock, swim off the private deck or soak up the sun on sun loungers on the expansive pool deck. These villas feature glass bottom tables on the outside deck, glass over-water bathtubs with views of the lagoon and outdoor rain showers, and treetop decks with comfortable seating areas. Private pools are only a few meters away from the beachfront, and sun loungers are strategically set for sunshine and shade by the pool deck. These private hideaways are set further along the weathered timber jetties and offer unfettered ocean views with direct access to the sea. 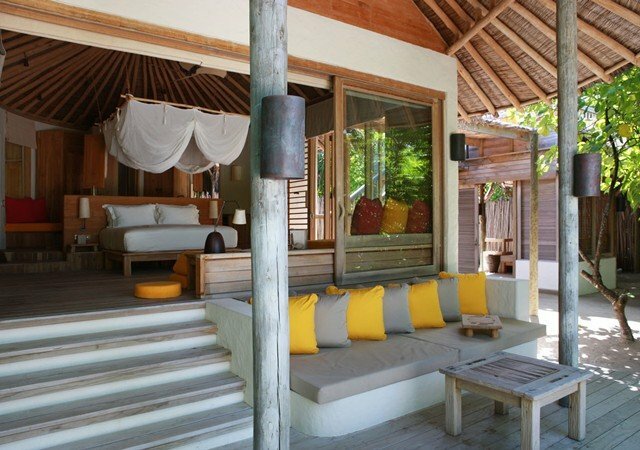 These beautifully appointed villas feature king-size bedrooms and en-suite bathrooms, spacious living areas, outside decks with glass bottom tables, glass over-water bathtubs and outdoor rain showers with ocean views, and unique treetop decks comfortable seating areas. Ideal for families traveling with children, Family Beach Villas with Pools are hidden between the lush tropical vegetation feature spacious beach villas with studies for accommodating children and extra adjoining bathrooms. Master bedrooms are strategically placed a few steps away from the children’s rooms with complete views of the swimming pool, and outdoor branch-encircled showers and outdoor bathtubs are a treat. Private garden areas boast tranquil escapes, and treetop deck with comfortable seating and dining areas offer idyllic ways to wine and dine in style against a backdrop of stunning ocean views. 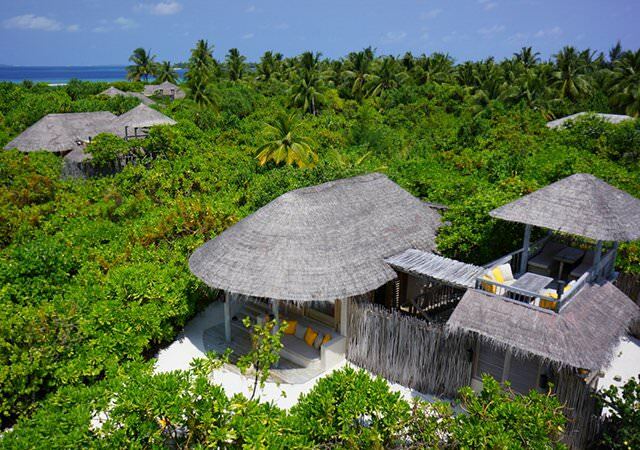 Six Senses Laamu boasts six Sea breezes drift among the rustic woods under high palm-thatched roofs at Laamu’s six bars and restaurants, most set over the water. 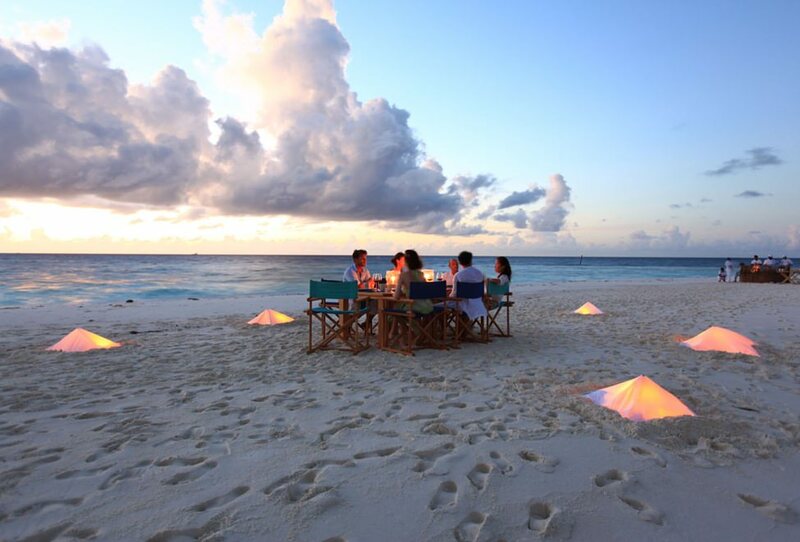 Dine on award-winning cuisine at several fine dining restaurants set above or near the translucent turquoise lagoon waters of the Indian Ocean or sip handcrafted cocktails over romantic rose-colored sunsets at one of the stylish and elegantly appointed bars. Six Senses Laamu’s signature restaurant, Leaf serves globally-inspired cuisine and traditional Maldivian fare prepared using only the freshest local ingredients. Guests can dine in an elegant setting perched above a beautiful organic garden, or privately or at the communal Chili Table. Take a culinary journey to the land of the setting sun at Zen, which features a live kitchen station the and an array of creative Japanese fusion cuisine with a contemporary twist. Guests can dine in a relaxed and casual atmosphere on the upper deck while listening to the ocean waves in the background and soaking up spectacular ocean views. 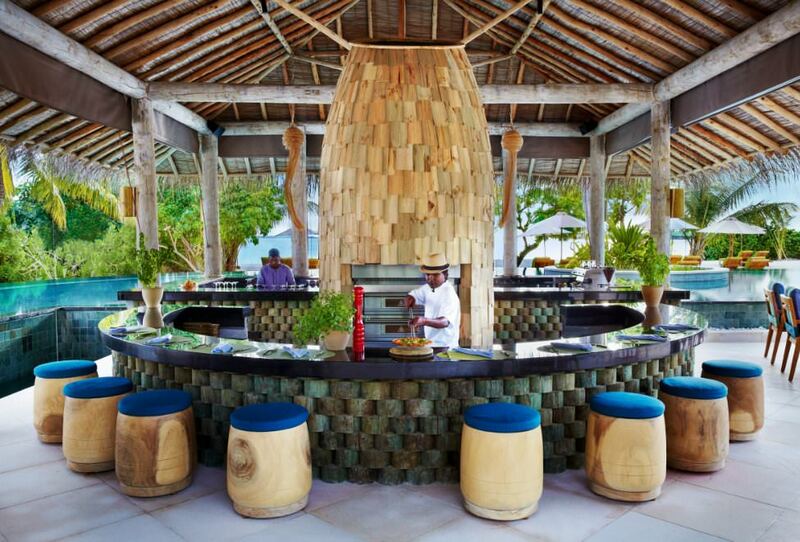 This open-air, two-story dining space serves international cuisine for breakfast, lunch and an extensive à la carte dinner menu of fresh catch, grilled meats, and handmade pasta with Asian accents. The enchanting poolside restaurant Sip Sip boasts a sunken bar and poolside seating that seems to emerge from the gin-clear infinity swimming pool and serves a seasonal, ever-changing menu of mouthwatering dishes that blend East and West flavors with homegrown produce from the island’s organic gardens. Sea breezes drift among the rustic woods under high palm-thatched roofs of the restaurant as diners relish fresh ‘farm-to-pool’ fare such as pan-fried goat-cheese salad with mango compote and cherry tomatoes, crispy Thai fish cakes on a peanut-and-green-mango salad, and a delicious Maldivian Chicken Curry with young coconut, Pandan rice leaves, and island spices. 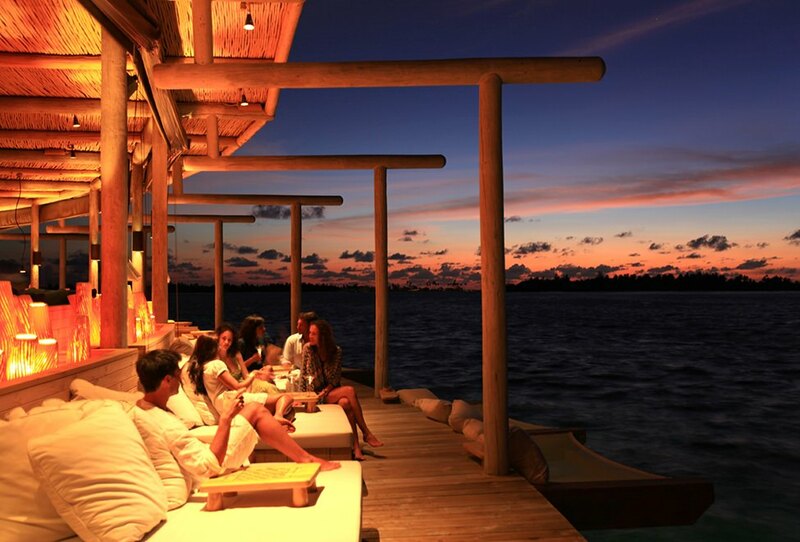 Built over the water and spread over several levels, Chill Lounge and Bar is the perfect place to sip handcrafted colorful cocktails and signature drinks against a backdrop of breathtaking views. Set right on the beach, Six Senses Spa Laamu offers a luxurious and pampering retreat with four uniquely designed couple’s treatment nests, four secluded couple’s treatment pavilions, and an extensive Ayurvedic treatment pavilion. A comprehensive range of award-winning signature treatments and rejuvenation and wellness specialties are provided by a team of highly skilled and professional therapists, who use a variety of natural products and a combination of holistic treatments and healing benefits. 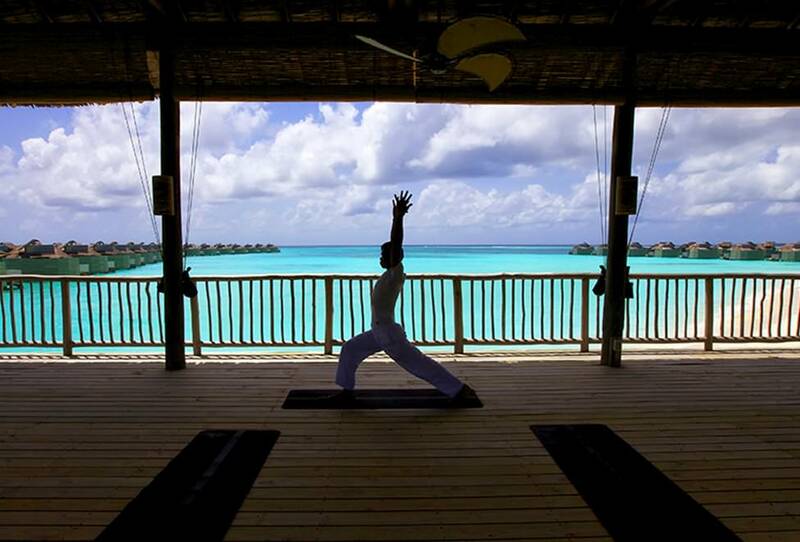 Six Senses Laamu offers an array of outdoor and recreational activities, as well as several interactive and educational programs and initiatives. 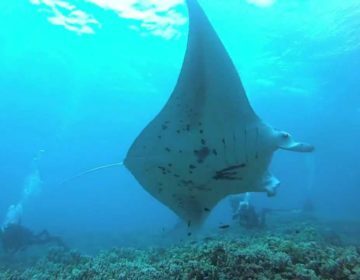 The resort is surrounded by pristine and untouched hard coral gardens with a diverse variety of fish and marine life that can be experienced by snorkeling, and scuba-diving. 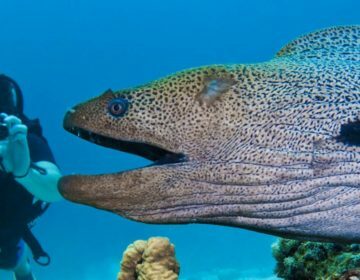 A professional multilingual dive team provides a range of experiences from guided snorkeling trips to exhilarating instructor-led night dives for all levels of swimmer, snorkeler, and diver. 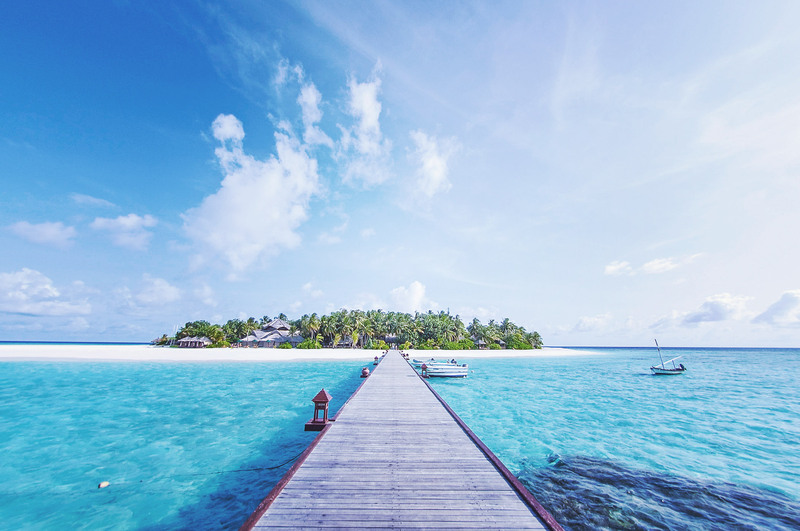 Laamu Atoll is a diver’s paradise with crystal-clear, warm waters, excellent visibility and unspoiled, vibrantly colored corals, underwater gardens, and millions of fish. Favorite dives sites include Reef Dives, Kandus, and Thilas, which are some of the best dive spots in the country. The Laamu Atoll is renowned for excellent surfing breaks such as Yin Yang, which breaks just offshore and is a surfer’s dream. Consistent, thick and best in a strong southeast swell, Yin Yang begins as a friendly wave with a beautiful wall and becomes more aggressive with a long, sturdy inside section that can produce some incredible hollow barrels. Outside the reef, Yin Yang has a mellow wall with safe, friendly rides in deep water. 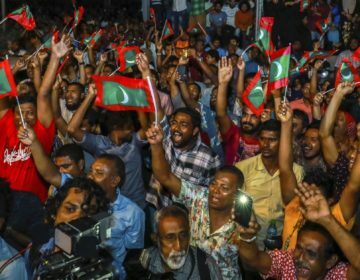 Other activities in and around the island to enjoy include wake-boarding, water-skiing., windsurfing, catamaran sailing, island excursions, exploring Hithadhoo Island, and picnics and barbecues on deserted islands. Six Senses Laamu provides an exquisite and unique location either on land or over water along with first-class services that dream weddings are made of. A professional Experiences team plans and organizes all types of wedding ceremonies and receptions from start to finish and caters for every need. 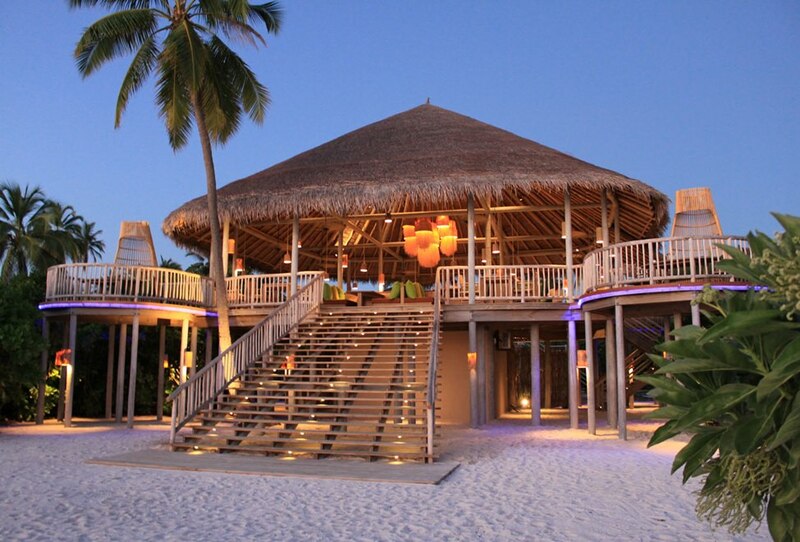 Six Senses Laamu is a child-friendly resort and offers an array of activities for families with children. The resort features a dedicated children’s club called The Den, a professionally managed children’s club with a wide range of activities and games, and babysitting services, which are available on request. Activities for families include volleyball, football, badminton, table tennis, card games, board games, treasure hunts, snorkeling, cycling, and non-motorized water sports such as canoeing, catamaran, and windsurfing. Other fun things to do for families include a cinema under the stars, dolphin cruises, island hopping and picnics, yoga and dance classes. 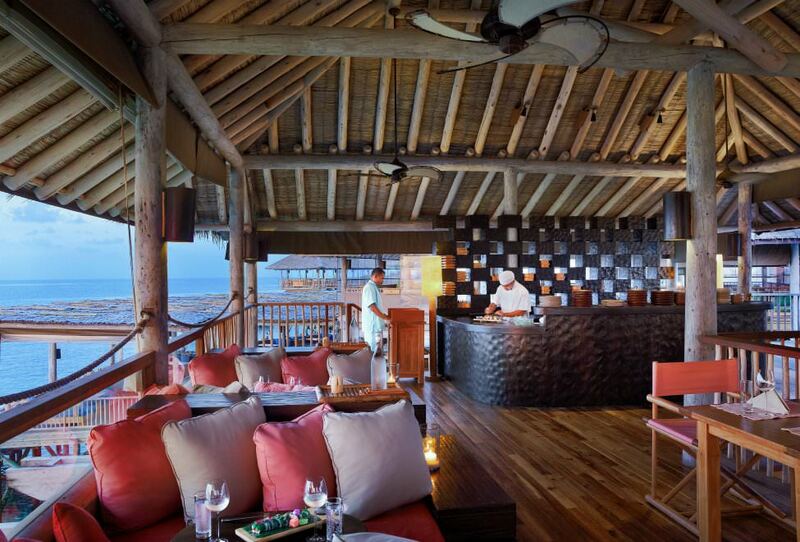 To book the Six Senses Laamu experience, click here.